She had already gained a minor reputation in 1927, when she was captured by French military police after penetrating their cordon around the rebellious Druze in Syria, nearly provoking an international incident. The victorious allies had divided the conquered territories of the Ottoman Empire following the First World War, and Freya, unmarried, and frustrated with her current life, was convinced a career could be carved from this exotic and mysterious part of the world. Quick and clever, she had taught herself Arabic and slipped into Syria to assess whether the French were abiding by their Mandate responsibilities. She determined they were not, and wrote a critical report that brought her to the attention of Britain's policy makers. Freya then turned her attention to Baghdad, in her view the true heart of “the East.” Settling into cheap lodgings that turned out to be the prostitutes' quarter of the city–and in the process, scandalizing the colonial wives–Freya planned a major sortie into the mountainous region of Persia, to locate the castles where the dread Assassins sect had held sway at the time of the Crusades. In three different and hazardous journeys, the intrepid explorer also ventured through remote Luristan in western Iran, one of the first Europeans and the first woman ever to do so. Her entertaining account became a best seller, and subsequent articles helped to bring to public attention the role of the Assassins as history's most successful terrorist group whose fiendish acts kept the Middle East de-stablized for nearly 200 years. 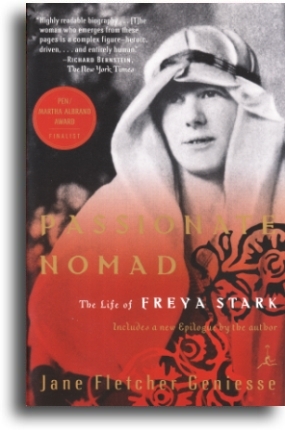 Feted, admired, and awarded the Back Grant by the Royal Geographical Society, the first of many prizes to come, Freya conquered the British establishment with her wit, warmth and extraordinary charm. But, as she said to friends, now that she had become “a traveler,” she feared she had no choice but to travel. So next she looked toward Yemen, the fabled land of the Queen of Sheba. Freya was certain she could be first to discover the lost city of Shabwa, capitol of the ancient kingdom of Hadhramaut described by the ancients as the richest city along the frankincense route. As always, the journey was fraught with adventures and mis-adventures, as well as a passionate love affair with an Indian Ocean tycoon from Aden who provisioned her trek into the deepest interior. While a guest in a sultan's harem, Freya caught measles, and had to be rescued by the Royal Air Force, a mishap that brought almost as much criticism in the press as it did praise from her admirers. Nonetheless, Freya became Britain's expert on Yemen, returning for subsequent sojourns, including as head of an archeological expedition that provoked a famous spat with her two female archeologist companions. With the outbreak of World War Two, the Ministry of Information quickly recruited Freya for the ultimate task of her career: to create a secret pro-allied propaganda network that proved so successful it survived the war and was ultimately suppressed by Nasser. Once considered a thorn in the side of British colonial officialdom for her habit of consorting with “wogs,” Freya was now extravagantly admired for her knowledge of Middle Eastern languages and customs, and consulted by both military and diplomatic figures. Throughout her long life–she died in 1993, over a hundred years old, having been knighted at the age of eighty-two by the Queen–Dame Freya rejoiced in the attentions of the press and of her audiences. In private she remarked that she put herself in harm's way in order not to fear death. But she also told her dear friend Lady Diana Cooper, that had she not been an explorer, she should love to have been a dress designer. And it was true: no one loved beautiful clothes and especially hats, more than Freya. Her indomitable spirit was forged by contradictions. A child of privilege, she grew up in poverty after her mother rashly left her father to live with an Italian count and engage in a hair-brained, idealistic manufacturing scheme. Freya yearned for a formal education but was largely self-taught, mastering seven languages. She longed for love but consistently focused on the wrong men. She was thirty-four before she extricated herself from her family and embarked on the travels that would bring her fame. Her astonishing career lasted over sixty years, during which she produced twenty-two books unmatched for perception and poetic prose. This is a brilliant, balanced biography, rich in sheikhs, diplomats, nomad warriors and chieftains, generals, would-be lovers, and luminaries, with the author Jane Fletcher Geniesse digging beneath the mythology to uncover a complex, quixotic, and controversial woman.